I love your site!! It has been so very helpful!! 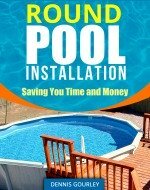 My husband and I are installing a 24' round Doughboy. We have rocky soil and while digging for the patio blocks on the end of the pool that is the deepest in the ground, have encountered rock on some of them. Is is okay that we have used some masonary sand (no more than 1/2" and as little as 1/4") to help in leveling those blocks that are uneven due to the rock? We have only used sand under the blocks, the blocks will be surrounded by dirt on all sides. Also, we have purchased wall foam, pre-formed cove, and floor pad. We will also be using sand for the bottom. Am I correct in the order they should be installed? first wall foam, then cove, sand smoothed and leveled up to the cove, pad over sand? Any helpful hits on how to install the pad and not disturb the sand? I plan to tape the pad to the cove if possible to avoid it moving during liner installation. We will be spraying a weed/grass killer as well as a fungicide on the foundation. Do you think we should put down plastic as well? Even though we would like to be further along than we are, I firmly believe taking our time, thinking/talking things through, and doing our research has already paid off! Hi Amy. There is nothing wrong with going slow, it is actually faster than having to redo it several times. aid. With the dirt packed around the blocks there is no way for it to wash out. I would start with the cove because it usually needs to be snapped into the bottom rails. I would do the walls next. If you have an overlap liner leave plenty of room at the top for the coping. Having the foam to high causes real problems later on. I would lower it about three inches from the top of the wall and hold it in place with duct tape. The bottom can be trimmed to the top of the cove and held in place with tape. I prefer stretching my liners into place. I do this from outside the pool. So once my sand is perfectly smooth I hop out of the pool and install the liner. I don't know of any way to install foam over sand without leaving footprints. If given the choice, I install the foam pad and then the sand. When a customer insists the liner go directly on the foam I do my best. I would use less sand, not more than a inch. Once it is spread and smoothed I water it and tamp it, I then smooth it again. Then the foam gets put over the sand. I have seen installers use sponge pads strapped to their feet, this seems to make sense but I have never tried it. I would not use plastic over the dirt unless you really think you will have vegetation problems down the road. You are better off without it. If you chemicals are oil based be sure to give the area a couple of weeks to air out before installing a liner.